Chattanooga is a comparatively small town in terms of media production, but living here has a number of advantages. A big advantage is our location… roughly equidistant to several very large metro areas, specifically Nashville and Atlanta. I can be in either place ready to work in about two hours. And while I do work in both places, there are sometimes other reasons to travel… continuing education, for example. The National Educational Telecommunications Association’s (NETA) annual conference was held in Nashville last week. 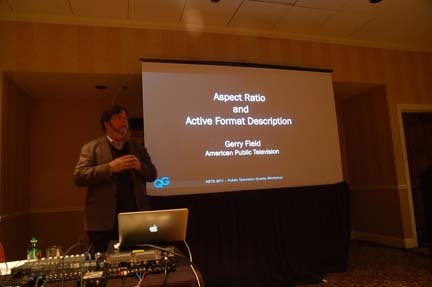 As a part of that conference, the Public Television Quality Group held a one-day workshop on production quality standards within PBS. This working group is an active education and training effort on the part of PBS to help stations transition to digital broadcasting and create “best practices” for digital production. And since I have worked on several PBS shows in the past, I thought it would be advantageous to attend. Fortunately, their workshops are open to non-members, and not too expensive to attend (only $60 for the day). Most of the people attending work in a PBS station environment… I believe Wallace Braud, myself, and two others were the only freelancers there out of about sixty people attending. 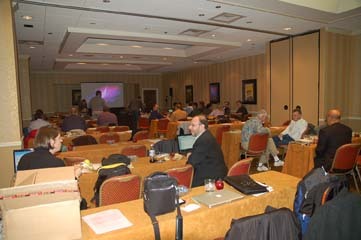 Some of the presentations were really only applicable to station engineering staff, such as “Managing Your Broadcast Multiplex” and Practical Implementation of AFD at Your Station.” But several of the presentations were either directly or indirectly related to audio, field video production/data capture, or audio aspects of post production. Much of this material is directly related to how I work, and will help me to be a better audio engineer. Audio levels are measured in DBFS. Anything over 0 dBFS is Very Bad, and occurs when the audio level exceeds the number of bits available. It sounds extremely nasty. In DTVs early days, folks new they had to set their internal reference tone below 0, but where? After some wrangling, the standard is set at PBS for -24dBFS average loudness, tone set at -20, dialog peaks at -10. While there was much more at the PBS Quality Group Workshop, (like a good explanation of Dialnorm and how it works) my clearer understanding about how the folks at PBS approach digital audio levels was worth the price of admission. This entry was posted in audio education and tagged Brian Gilbert, nashville, NETA, PBS. Bookmark the permalink.